A massive, 426-page bill introduced to the Montana Legislature Wednesday would create a 2.5% statewide sales tax, as well as cut three different types of property tax. House Bill 300, sponsored by Rep. Kerry White (R-Bozeman) would tax most transactions, including internet sales, with some exceptions, like SNAP-eligible food and medicine. White said the revenue collected from the tax will go to local governments to fund K-12 schools and infrastructure projects. White also said no money collected from the tax will be going into the state general fund. “I want this money to be focused on infrastructure, health, safety and welfare,” he said. The bill also sets a “tax holiday” between October 20 and November 20. During this period, the tax would be lifted. White said the tax is targeting tourists, who he said will take 33% of tax responsibility with his new bill. The “holiday” is set in-between summer and winter tourism seasons. Rep. Mark Nolund (R-Bigfork) was the only supporter of the bill during the House Taxation Committee’s public hearing Wednesday. He said Montanans are burdened by high property tax and the state tax system is in need of restructuring. Director of the Department of Revenue Gene Walborn opposed how the bill completely cuts agricultural, residential, commercial and timberland property tax. He says relying on income and sales tax would be unstable. The bill also completely eliminates the property tax office, which collects the kinds of property taxes that would be cut. White said removing the office would save the state $26 million while Walborn said this would also remove around 200 employees from the Montana Department of Revenue. Heather O’Loughlin is the co-director of research and development at the Montana Budget and Policy Center, a non-partisan, nonprofit that researches Montana budget, tax and policy issues. She was one of nine opponents to the bill at the hearing, and said a sales tax harms low-income people who spend most of their income on goods and services. “Montana is still asking those at the bottom to pay a greater share of their income in taxes than those at the top,” she said. The House Taxation Committee did not immediately vote on the bill. Tim Pierce is a reporter with the UM Legislative News Service, a partnership of the University of Montana School of Journalism, the Montana Broadcasters Association, the Greater Montana Foundation and the Montana Newspaper Association. Shaping policy for a stronger Montana. 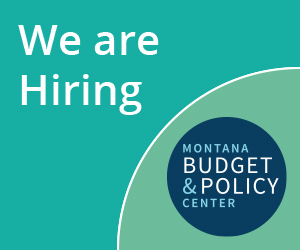 MBPC is a nonprofit organization focused on providing credible and timely research and analysis on budget, tax, and economic issues that impact low- and moderate-income Montana families.